Portable Chillers – Thermal Care, Inc.
Portable liquid chillers, like all liquid chillers, cool liquids like water, oil, brine, alcohol, acid, gasoline and special coolant chemicals for industrial applications. 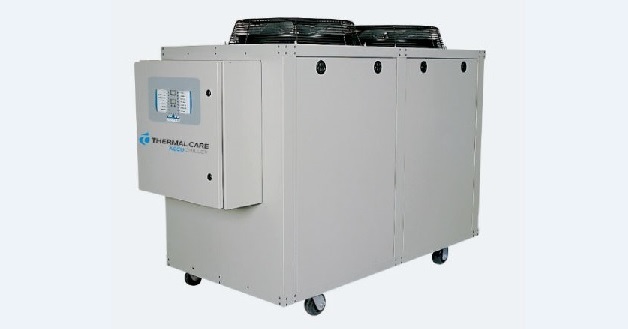 Portable chillers tend to be smaller and more lightweight than traditional industrial chillers, and are often mounted on casters, allowing for easier mobility and transport. A typical cooling capacity range for them would be between 1/3 ton and 60 tons. The variety of applications for portable chillers includes cooling for lasers, MRI and PET scan machines, water jet pumps and tanks, plastic molding machines, bread processing and other processes in the machine tool, fabrication, medical, food, chemical, heat treat, filtration, welding, plastics, power generation and dry cleaning industries. Portable chillers use vapor-compression refrigeration to provide their cooling effect. This involves piping a refrigerant through four major phases. First the refrigerant vapor is compressed using a gas compressor. Most portable chillers use a scroll-type compressor, because they having fewer moving parts and therefore tend to be more compact, cause less noise and vibration, and run more smoothly and reliably at low volumes than reciprocating compressors. Second, the hot, compressed refrigerant vapor enters a condenser, where it is cooled and condenses into a liquid. Portable chillers tend to employ either air- or water-cooled condensers, since they are more practical for a wider range of situations than evaporation-cooled condensers. Air-cooled condensers cool by circulating air around tubes containing the refrigerant, contributing to its condensation. These condensers are used in instances where water is unnecessary or unavailable. Water-cooled condensers circulate water around the tubes to cool and condense the refrigerant. Water-cooled condensers are more effective at cooling but are more complicated because they require a water source and an outlet for the heated water. Third, after the refrigerant has been condensed it goes through an expansion valve that reduces the pressure quickly and causes flash evaporation to occur, cooling the liquid significantly. Lastly, the refrigerant continues to evaporate as it moves through the evaporator and absorbs heat from whatever process it is cooling, until it is entirely vapor and again enters into the compressor to be recycled. Portable Chillers Portable chillers are relatively small, movable, single pump machines that remove heat from a liquid through a cycle of compression, condensation, and evaporation. The chilled liquid is usually then piped as a coolant to a heat exchanger in order to cool a piece of equipment, a manufacturing process, or a stream of air. These self-contained chillers are useful in small and/or dedicated applications and have the ability to cool one or two machines at a time.